Net cash farm income and net farm income are two conventional measures of farm sector profitability. Inflation-adjusted U.S. net farm income is forecast to decline $11.4 billion (14.8 percent) from 2017 to $65.7 billion in 2018, while inflation-adjusted U.S. net cash farm income is forecast to decline $14.6 billion (13.8 percent) to $91.5 billion. The forecast declines are largely due to higher production expenses, which if realized, would reduce net income. Additionally, government payments are forecast to decline $2.3 billion (19.1 percent). However, the 2018 forecast for government payments, net farm income, and net cash income do not include payments under the Market Facilitation Program (MFP), because it is too early to tell from the details announced August 27, 2018 how many farm producers will complete MFP enrollment and receive payment in 2018. 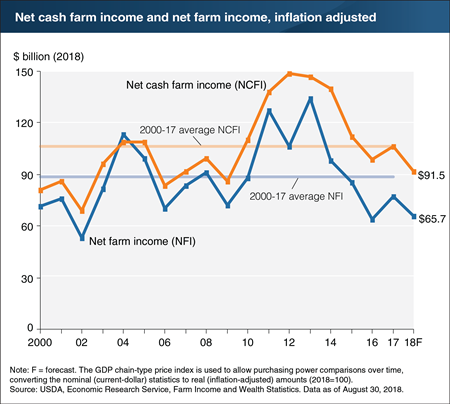 Inflation-adjusted net farm income is forecast to be just slightly above its level in 2016 and at its second lowest level since 2002; inflation-adjusted net cash farm income is forecast to be at its lowest level since 2009. Net cash farm income measures cash receipts from farming as well as farm-related income, including government payments, minus cash expenses. Net farm income is a more comprehensive measure that incorporates non-cash items, including changes in inventories, economic depreciation, and gross imputed rental income. Find additional information and analysis on ERS�s Farm Sector Income and Finances topic page, released August 30, 2018.